The first business meeting for March was held March 4, 2019 at the Great Valley Middle School in Room 154, 255 N. Phoenixville Pike, in Malvern, PA.
Frank A. Piliero, Chairman, Charles A. Philips, Vice-Chairman, Susan T. Bednar, Kevin R. Kuhn, and Hugh D. Willig. Mark P. Thompson, Esq., Thomas Comitta, and Daniel T. Wright, P.E. Linda Csete, Manager, Jim Thompson, Roadmaster, Tim Hubbard, Public Safety & Property Coordinator, and Lisa Gardner, Recording Secretary. There was an executive session held following the February 4, 2019 meeting to discuss legal matters. Mr. Kuhn announced a French Creek and Pickering Creeks Trust Conservation easement that closed last week on the Beam-Dugdale property consisting of approximately 10 acres. Mr. Thompson announced the Auchincloss closing for the parcel with the house, has happened since the last Board meeting. No matters were brought forward. Mr. Kuhn moved to approve the minutes for the February 4, 2019 Business Meeting, and Mr. Philips seconded. Mr. Piliero called for discussion and there being none, called the vote. All were in favor. Mr. Philips moved to approve the February 2019 Treasurer’s Report and Mr. Kuhn seconded. Mr. Piliero called for discussion and Mr. Kuhn asked why there was a Charlestown Landscaping invoice due this time of year. Mrs. Csete will research. Mr. Piliero called the vote, and all were in favor. Mr. Kuhn moved to approve the Operating Fund Accounts Payable Report for March 4, 2019 and Mr. Philips seconded. Mr. Piliero called for discussion and there being none, called the vote. All were in favor. Mr. Kuhn moved to approve the Open Space Fund Accounts Payable Report for March 4, 2019 and Mr. Piliero seconded. Mr. Piliero called for discussion and there being none, called the vote. All were in favor. Mr. Philips moved to approve the Liquid Fuels Fund Accounts Payable Report for March 4, 2019 and Mr. Kuhn seconded. Mr. Piliero called for discussion and there being none, called the vote. All were in favor. Mr. Kuhn moved to accept the February 2019 reports #1-14 as submitted and Mr. Philips seconded. Mr. Piliero called for discussion and there being none, called the vote. All were in favor. 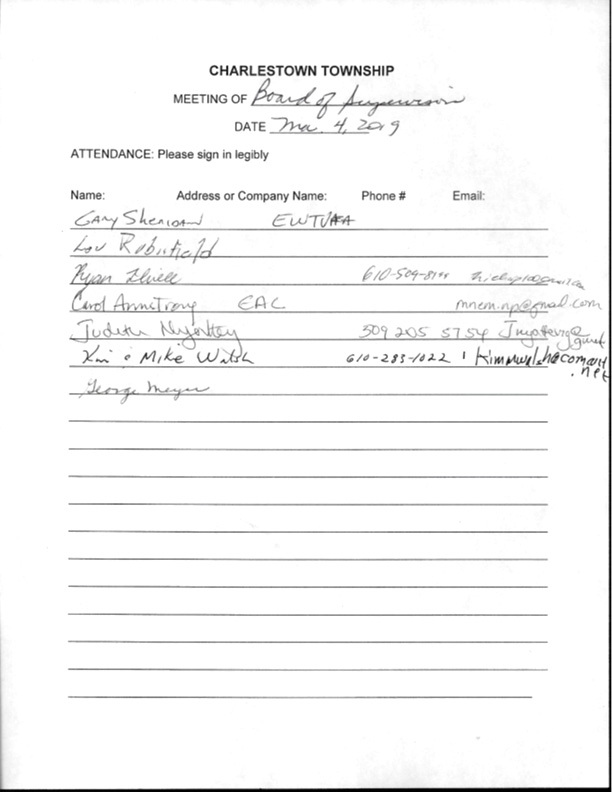 T-6 Planning Commission meeting minutes dated 2/26/19 with the recommendation for approval. Following testimony, Mr. Thompson closed the hearing. A decision will be provided within 45 days. Eagle Scout candidate Ryan Thiele presented his plans for a project in Charlestown Park to install a split rail fence, preventing soccer balls from rolling away from the field. He will include chicken wire at the bottom and has already arranged for materials. The permit and payment for the materials will be received from Mr. Maurer of the soccer club. The estimate is $1,082. Scout Thiele will work with the Township Engineer and Mr. Hubbard. The following bid was received by the deadline at noon today, for road equipment and labor for the period of April 1, 2019 through March 31, 2020. The amount of $141,900 by Melchiorre Construction Company was read aloud. The bid was turned over to Mr. Wright for review and comparison to last year’s figures. Recommendation for the bid award will be considered at the April 1, 2019 meeting. Mr. Wright provided a handout proposing the following roads for resurfacing this year: Mr. Wright will return to the next meeting with preliminary estimates and measurements for the Board. Then, they will decide how much of Howell Road they want to repave. Mrs. Csete suggested a budget of $350,000. Mr. Wright said the next step for extending Southwest Avenue thru to Park to Coldstream Road is a full traffic engineering review, for which he offered to draft an RFP for a traffic engineering firm. The Board would like to continue in this direction. Mr. Wright said everything was in order for this release. Mr. Philips moved to approve Escrow Release #7 for Cedar Run in the amount of $332,922.16 and Mr. Kuhn seconded. Mr. Piliero called for discussion, and there being none, called the vote. All were in favor. Mr. Kuhn said he spoke with Mr. Dettore regarding the completion of various maintenance and repair items at the Brightside farmhouse. Mr. Dettore suggested performing this work as a change order to the 2015 structural repair contract once the scope, price and schedule are confirmed. The next step is for Mr. Dettore to return to the Board with a Scope of Work and a Do Not Exceed price. Mr. Thompson reviewed the draft Conditional Use decision for Crown Castle to permit the installation of a utility pole on Phoenixville Pike in the right of way in front of the Chester Valley Grange, near the Apostolic Church. Mr. Kuhn moved to approve the Conditional Use decision for Crown Castle, and Mr. Philips seconded. Mr. Piliero called for discussion, and there being none, called the vote. All were in favor. Mr. Kuhn provided background on discussions he’s had with East Whiteland Township and Natural Lands Trust regarding a joint purchase of the Balderson Tract. It is bordered by Phoenixville Pike (across from the High School) and Route 401. The tract is comprised of 143 acres, of which 40% are located in Charlestown. The appraisal is in the $600,000-$700,000 range. An additional adjacent 12 acres is available in the $100,000 range and may be combined with this purchase. The land would be used for passive open space and trails. East Whiteland Township is submitting a grant application to both Chester County and the DCNR that will cover a portion, if not all, of the purchase price. Natural Lands Trust is drafting proposals for funding. The Board will pursue this joint project. Mr. Thompson initiated a Hearing to consider the acquisition of the two Union Hill Road properties owned by the Thompsons and Davises. Mr. Philips moved to adopt Resolution #940-2019 and Resolution # 941-2019 approving the purchase of a conservation easement on the Thompson property at 2202 Union Hill Road, parcel #35-2-119.01H (23.8 acres) for $583,000, and a conservation easement on the Davis property at 2121 Union Hill Road, parcel #35-4-70 (17.1 acres) for $425,000. Mr. Piliero seconded. Mr. Piliero called for discussion, and there being none, called the vote. All were in favor. Mrs. Csete said the Chester County Planning Commission has completed its update to the Chester County comprehensive plan, called Landscapes 3. They requested endorsements from the 73 municipalities county-wide. Mr. Philips moved to adopt Resolution #942-2019 endorsing Landscapes 3, and Mr. Willig seconded. Mr. Piliero called for discussion, and there being none, called the vote. All were in favor. Mr. Philips asked if any other Supervisors were attending the CCATO Spring Conference. None are, but Mrs. Csete will attend the morning session. Mr. Wright stated there will be a letter going to residents and HOAs who, within the past 20 years, received a NPDES Permit for stormwater management. They will be required to provide an annual report to the Township Engineer from a professional engineer stating the facility is performing correctly in order to comply with MS-4 regulations. Mr. Piliero received a report from East Whiteland Fire Chief Gary Sheridan that an engine had crashed reporting to a scene in bad weather, however two new engines are expected to be delivered soon. Mr. Piliero thanked Chief Sheridan for his service and for attending the Board meetings. Mr. Piliero adjourned the meeting at 8:45 p.m. The next Board of Supervisors Meeting is scheduled for Monday, April 1, 2019, 7:00 p.m. at Great Valley Middle School, Room 154, 255 N. Phoenixville Pike, Malvern, PA.